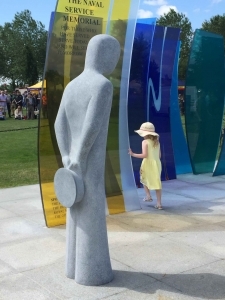 I am delighted to announce that “The Naval Service Memorial” that I designed, located at the National Memorial Arboretum, has been short-listed for the PMSA Marsh Award for excellence in Public Sculpture. I was extremely honoured to have been selected to create the Naval Service Memorial and was pleased to have the unanimous backing of the RNA (Royal Naval Association) for the ambitious design from the very start. Another key theme was “At the going down of the sun, we will remember them”. At one end of the memorial, a carved stone sailor stands alone, facing west, head bowed in respect in front of a yellow glass panel representing the morning sun. At the opposite end, a deep red panel – sunset. Inspiration for my work often comes from unusual sources. No more so than in this piece where the idea to create the “shadow ship”, stemmed from observing the outlines of shapes created by the shadows of the washing on the lawn at home as my wife pinned it out. 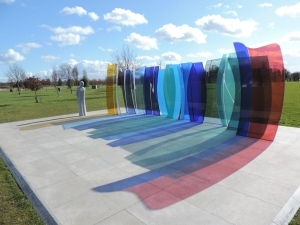 One of the challenges with this memorial was to maintain the simplicity of the design with so much happening within it. This is something that I was conscious of throughout. The glass was precisely cut, laminated, strengthened and installed by Proto Glass in Pewsey while I carved the Kilkenny Limestone sailor myself. No rank, no gender. Bell bottomed trousers and cap behind his back the only detail required. The winner of the award will be announced on the 2nd November at an event in London.